RACINE — An incident in Racine on Monday led to the arrest of one person on outstanding warrants and pending charges against another individual. Meigs County Sheriff Keith Wood stated in a news release, that on Monday, Feb. 4, his office received a call that Travis Klein, age 29, appeared to be under the influence of drugs on Third Street in Racine and was believed to have possession of a firearm. The caller stated that they received a message that Klein had a hand gun and was holding a female hostage in a residence located on Third Street. Deputy Tylun Campbell with K9 Cheri, Deputy Josiah Leggett, Deputy Matt Martin, Deputy Clint Patterson, Sgt. Rick Patterson and Sheriff Keith Wood responded and was able to locate Klein while crossing Third Street and attempting to enter a residence. During the apprehension Klein appeared to be under the influence of drugs. He was then treated by Meigs County Emergency Medical Services for a potential overdose and was transported to Holzer Emergency Room. Deputies attempted to make contact multiple times with anyone inside the residence on Third Street and when no response was received, deputies made entry into the residence and located a female in the living room of the residence unharmed. The female, identified as Stephanie Shamblin, age 27, was hiding under a sofa bed located in the living room. Shamblin, who had outstanding warrants out of the Meigs Common Pleas Court, was taken into custody and transported to the Meigs County Sheriff’s Office. Deputies searched the residence after a consent to search form was signed by the resident. Deputies located a hand gun and drug paraphernalia inside the residence. Charges are pending against Klein at this time. 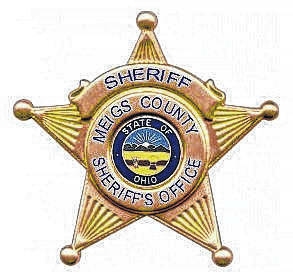 Information from the Meigs County Sheriff’s Office.